As a fan of horror and video games, I’m often searching online for small, independently made horror games. A few years ago I discovered a bunch of role-playing/puzzle/horror games made in Japan that I thoroughly enjoyed. Among those games was Ao Oni. It is a simple game about four kids being chased by a huge, purplish-blue monster. I liked it, but I always thought it was one of the lesser titles within its category. Little did I know at the time that it would become a cult hit in Japan and across the world thanks in part to the game’s quirky personality as well as exposure from huge YouTubers like PewDiePie and Markiplier (among countless others). The original game has spawned tons of fan-made games, a series of light novels, two live action movies, and now an anime series. Ao Oni: The Animation is a short anime television series currently airing in Japan and streaming on Crunchyroll. Judging from the first episode, the series follows the plot of the game pretty closely. Four high school kids enter an old mansion which is rumored to have monsters wandering around inside. 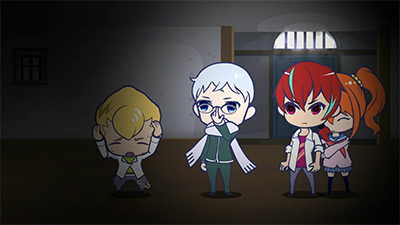 They get trapped inside and have to solve a series of puzzles in order to try to escape, all while the mysterious Ao Oni (roughly translated as “Blue Demon”) relentlessly hunts them down. Like the game, it’s a pretty simple setup, but with each episode only running at around three minutes long, there’s not a whole lot of time for a much deeper story. The game was kind of silly thanks to its generic plot, goofy dialogue, and a villain whose smirk made it look like it was always on the verge of laughter, and the anime looks like it will take the story’s humor to even higher levels of absurdity. In the first episode, the four kids discover that they are trapped inside the mansion, and Hiroshi, the smart one, tries to make sense of their situation by using science and logic. 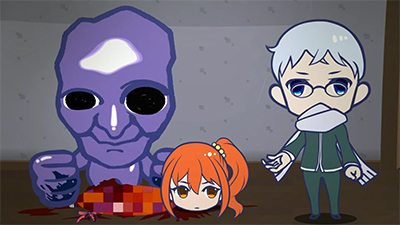 While he’s figuring things out, the Ao Oni is happily murdering all of Hiroshi’s friends behind him. His friends don’t seem to notice or care that they’re being dispatched in horrible and bloody ways though. They keep on talking as if they need to form a plan to escape, even though one has had his head completely eaten off his neck and another’s body has been beaten into a bloody mess. Unlike other versions of Ao Oni, this one doesn’t appear like it will be scary at all, but it might be worth watching for the sheer goofiness. The show is completely nonsensical, but that’s the point. Ao Oni: The Animation is a silly comedy with horror elements. And since the episodes are so short, the comedy comes fast and non-stop. By the end of three minutes you’ll probably be wondering what you just watched. Not that that’s necessarily a bad thing. As for the look and feel of the show, the animation is done in a simplistic, flash animation style. I’m generally not too fond of that style, but it fits the tone of the story well. It’s simple and silly. The characters are all from the original game but are redesigned in a cute, super-deformed way, also fitting with the tone. All the elements work well together for what they’re trying to accomplish with Ao Oni: The Animation, so whether you’ll enjoy the show or not really comes down to the type of humor you enjoy. I like a good show where nothing makes sense, so I think I’ll stick around for a while in the mansion with Hiroshi and his friends. This show won’t be for everyone. You have to enjoy absurd, silly humor. Also, if you’re a fan of the game and are looking for some scares, you might want to try to find the live action movies, or wait for the upcoming animated movie. Those versions seem like they’ll be more in line with the mix of humor and horror present in the game.